When I think about Lebanon today, I always end up remembering my father. He was born on 10/10/1910 and died 104 years later. As many of his generation, he attended primary school in the north of Lebanon, worked with his family in their fields, went to Brazil to work with his father and brother selling household goods from a dugout canoe on the Amazon, lost it all in the Depression, returned to Lebanon via a stay in France, and then rebuilt his family farm so that they could have a continuing source of food. For cash he made charcoal to sell in the surrounding villages and then went to work in a bicycle shop in Beirut. Not very glamorous to be sure…but along the way he learned Arabic, French, Spanish, and Portuguese, at least enough to survive and succeed. Then along came my mother Elizabeth, who had emigrated to the US years before and returned to Lebanon to marry the man she had decided was for her…and my dad’s life changed forever. Not that he had much choice. She was strong-willed, a relative, and knew what was best for him. So they traveled to the US and followed so many before them in selling goods to local communities first as peddlers, then from trucks and small stores. Not much news here but it is useful to learn from the past when we are trying to figure out why so many of us still love Lebanon despite its various attempts at self-disfiguration as in the abuse of the environment, and its efforts at self-destruction as reflected in the political culture of the country. Fortunately, my parents lived close by in their last years so I had some time to reflect with them on their journeys. When I asked my dad how he was able to take on so many new responsibilities during his lifetime, his response was simple, “To survive, , I was always ready for the next adventure.” When I see the frustrations in Lebanon today, as he must have when he first returned 30 years after he left, I wonder what happened to those Lebanese qualities of risk-taking, entrepreneurism, sense of community, and initiative that are absent in its political culture today. You can argue that there are many business start-ups, that the Lebanese continue to showcase their talents globally, and that it can master its future if only left alone without external interference, but that’s not what is evident in Lebanon today. The private sector is grossly under-resourced and constrained except for its wealthiest members. Lebanese abroad are reluctant to invest significantly due to the lack of transparency and corruption in dealings; and Lebanese politicians seem content to mortgage Lebanon’s future to authoritarian allies in the region and beyond. Confessionalism eats away at the body politic so that even the best and brightest feel obliged to find champions outside of the country. Syria and Iran and likely Saudi Arabia act as if they have rights in Lebanon to dictate its future and too many Lebanese are ready to comply, if only to settle long-standing grievances with other clans and parties. And who can tell how Russia’s interests will further skew Lebanon’s independence. There are many issues emblematic of these dysfunctional tendencies that are on the agenda once government formation occurs, or new elections are held: a realistic and rapid timetable for the professional and transparent implementation of political and economic decentralization; the role of Hezbollah in the future of Lebanon; the need to invest heavily in the education and health sectors despite the current overloads caused by the refugees; rapid and transparent implementation of the reforms needed to respond to the international donor community as well as private sector investors; placing quality of the environment among the top action items for the government, particularly in enabling communities to take local initiatives; acting to reduce the challenges limiting opportunities for youth, women, and the marginalized; and integrating strategies for infrastructure initiatives in power, communications, transportation, and services sectors, among others. These and other concerns have been identified in multiple studies, the proposals to the CEDRE conference, and in negotiations with multilateral organizations including the World Bank Group and UN agencies. Lebanon would be well-served by recalling and re-acting on the intentions in the Taif Agreement to implement functional decentralization to provide training and resources for local populations to manage their affairs within a national strategy for services such as waste management, power generation and distribution, access to potable water, and a nation-wide youth services program that rebuilds the environment, promotes hygiene and health services in underserved areas, and connects young people across sectarian and geographic boundaries. One thing the Abrahamic faiths share is the belief that “God helps those who help themselves.” This was very true of my parents who never lost their faith in God or in Lebanon. Unfortunately, unless a consensus for moving forward comes together in the near future, it may more likely be that others, including Israel, Iran, and Syria will be helping themselves to a fractured Lebanon, and only the Lebanese can keep that from happening. It has long been said somewhat cynically that Lebanon’s raison d’etre is to serve as the proxy battlefield for everything in contention in the region and beyond. Certainly, contemporary events bear that out as PM Saad Hariri struggles to build consensus around a new government and ministerial statement while regional players continue to shuffle the policy cards to determine what’s next on their agendas. Distinctions between the players’ existential concerns and their dominate current interests are muddled at best. The Assad regime draws closer to its immediate goal of restoring its punishing control over Syria; Iran seeks to strengthen its regional role despite rising domestic opposition; Turkey is…well Turkey; Russia and Israel look to their interests with fervor; and the Syrian refugees await their fate. Here’s a quick summary of several current events that are adding to the continued uncertainty despite the latest battlefield outcomes in Syria, a small détente between Israel and Syrian government forces near its borders, Syrian refugees moving in larger numbers back home, and Hezbollah’s quest for meaning after Syria. Lebanon-Syria relations, always contentious, seem to be the chicken bone in the throat of PR Hariri. Despite prodding from Speaker Nabih Berri, pro-Syrian members of Parliament, Gebran Bassil, the acting Foreign Minister and son-in-law of President Michel Aoun, and others, the PM is standing his ground that the ministerial statement, which outlines the new government’s priorities, will not address restarting formal relations with Syria. Can he hold out? There’s no immediate consensus as there are other MPs supporting the PM. Proponents of the move argue that the step is needed to facilitate the return of Syrian refugees, re-open border crossings to allow goods to transit to export markets to Lebanon’s neighbors, and potentially give Lebanon a piece of the Syrian reconstruction pie. Syria meanwhile seems to be holding refugee repatriation hostage to resuming relations. Over the past two weeks, a number of statements have come from Syrian sources, as well as its friends in Lebanon, that formal relations are the key to accelerating recent repatriation actions. It is worth noting that despite allegations that the Assad regime has a list of a million or so unwanted returnees, it also craves to be recognized as a legitimate government that can manage the resettlement process. The UNHCR is directly bound up in this quagmire as it serves as the mediating body for the international community on refugee affairs. It has outlined its criteria for conditions required to move ahead with large-scale voluntary repatriations in cooperation with the Syrian government. To date, however, the regime has imposed restrictions on UNHCR activities in Syria, which could leave returnees without adequate aid and exposed to more danger. What’s in the cards for Hezbollah’s hands in Syria and Lebanon is a subject of much speculation. Will it return to its traditional role as a political-military state within a state in Lebanon? Will it maintain a presence in Syria to enable Iran to continue to have a pressure point on Israel? Will it maintain an aggressive posture towards Israel so that Israel leans on Russia and the US to exercise what little leverage they have over the Iran-Hezbollah axis to keep tensions from boiling over? So is the other great power, the US, still searching for a regional strategy? It appears that the Trump Administration has conceded that the war in Syria is now at a stage where the US should move on to focus on a formal end to the civil war and reconstruction. Jim Jeffrey, former US Ambassador to Turkey and Iraq, a distinguished fellow at the Washington Institute for Near East Policy (WINEP), who served as the principal DAS for the Bureau of Near Eastern Affairs at the State Department, and deputy national security adviser to President George W. Bush, has been appointed as Representative for Syrian Engagement by Secretary Pompeo. His job is to run US negotiations with other regional players over Syria’s future. He has extensive experience in the region that should serve him well. As Ambassador to Iraq, he opposed the US withdrawal from the country under the Obama Administration, arguing that without a tangible presence in country that Iran’s influence would prevail. So he has no illusions about Iran’s regional ambitions. One of his first challenges is to ensure that the latest deal made by the Administration, to have others pay for Syria’s stabilization fund, is carried out effectively. In announcing the US cut of its commitment of $230 million in stabilization assistance, the State Department pointed out that the Gulf States and others have agreed to fund the program. Stabilization aid is intended to provide basic services that allow Syrian residents to return to their homes and some semblance of normal life after a devastating seven-year civil war. Al-Monitor.com reported that the “US has elicited approximately $300 million in contributions and pledges from coalition partners to support critical stabilization and early recovery initiatives in areas liberated from [the Islamic State (IS)] in northeast Syria, including a generous contribution of $100 million by Saudi Arabia and $50 million pledged by the United Arab Emirates.” Other commitments have been made by Kuwait, France, Germany, Italy, Denmark, Norway, the European Union, Australia. and Taiwan. The spokesperson, Heather Nauert, explained that the decision “does not represent any lessening of US commitment to its strategic goals in Syria.” Which again raises the earlier question, does the US have a viable regional strategy that represents its long-term interests in the region? While reading through the transcript of the joint press conference of Presidents Trump and Putin in Helsinki, there are many statements that have drawn the ire of analysts in Washington and elsewhere. But there are statements about the Syrian refugees in Jordan, Lebanon, and Turkey that bear closer scrutiny for what they say and imply, and how the novel definition of Trump “realism,” which stresses partnership with the Russian leader, can contribute to solving the dilemma of refugee repatriation. So it is fair to ask what was said and is there any reason to draw positive inferences from their words? Looked at in a regional context, Trump suggested that protecting Israel was the key priority, to keep it safe by reducing instability caused by the refugee crisis. “As we discussed at length, the crisis in Syria is a complex one.” He added, “Cooperation between our two countries has the potential to save hundreds of thousands of lives.” He referenced Russia’s growing ties with Israel, “But I think that their [Russia] working with Israel is a great thing and creating safety for Israel is something that both President Putin and I would like to see very much,” without as much as a whisper about the security and stability of Jordan, Lebanon, and Turkey. How this continues to strengthen Russia’s hands as the reigning great power in the region was not referenced, so is the US preparing to turn the region’s future over to some vague partnership that Russia leads and the US follows? So what these responses mean in practical terms will unfold in the coming weeks. Humanitarian assistance promised by the EU and facilitated by Russia underscores its leadership on this crisis. Putin made reference to the Astana Process, which includes Iran and Turkey, as a key coordinator of policy initiatives regarding Syria, further reinforcing its primacy on the Syria issue. And the implication is that this is likely what Trump supports: withdrawing US presence in Syria, supporting an Israeli-friendly peace process with Palestine, and gradual political and military disengagement from the region. Now that the Lebanese and Iraqi elections are over and the countries’ political parties brace for the implications of whatever internal power-sharing arrangements emerge, the long shadow of Israel makes itself felt in Beirut and Baghdad. Both countries have critical internal issues to address as well as keeping an eye on regional concerns that could undo whatever domestic progress is possible. Lebanon cannot ignore its neighbors – an ascendant Assad regime in Syria that is close to achieving control over most of its urban areas; an Israel that continues to issue hostile statements regarding Lebanon’s internal political arrangements that allow Hezbollah key political and security roles; and as yet unfinished business on defining its borders with Israel. And then there is a very long domestic agenda that is made more challenging by the need to satisfy so many entitlements claimed by the competing parties. Iraq’s struggles are even more complex. A coalition government that can be formed in a reasonable period of time will buy the leadership some space to address multiple internal security, economic, and social issues. And there is much more: what to do with Iran’s military, political, and economic presence that has only deepened with the success of its militias and proxies in combating ISIS and other militants; how to bring some sense of security on its border with Syria where US and coalition forces are working to eliminate terrorist threats in the area; how to manage relations with Erdogan’s Turkey and the restive Kurds; and an Israel government that is suspicious of Iraqi intentions under perceived Iranian influence and outright military muscle. There is no escaping the reality that conditions are ripe for a significant rise in hostilities. Analysts warn that although none of the parties seem intent on ratcheting up tensions at this time, there is broad agreement that a miscalculation by any of the potential combatants can unleash a firestorm. With Israel toughening its redlines concerning Hezbollah’s activities in Lebanon and Syria, Iran’s deepening presence in Syria, the likely movement of Syrian and allied forces into areas close to Israel’s border, and Russia’s reluctance to take on a more proactive role in defusing tensions, opportunities for a flame-up are multiplying…and this is not even including what the UAE and Saudi Arabia are intending. So the question is, how are the governments-to-be in Lebanon and Iraq to demonstrate wisdom in forming governments to avoid as much as possible the tipping points that undermine their countries’ stability? Can the leadership rise above sectarian and community identity politics and agree on a statement of principles and policies that diminish prospects for being dragged into regional conflicts? Will the new governments, based on broad consensus, be able to withstand external pressures on their internal politics? It is interesting that Muqtada al-Sadr’s coalition won the largest number of seats in the elections running a populist, even Trump-like campaign, wanting to drain the swamp in Baghdad, fight corruption, and return government to the people. Sunnis were drawn to his lists as they were to Haider al-Abadi’s lists, challenging age-old sectarian divides. But the wild card of the standoff between Iran and Israel casts a pall on the government formation process in both countries. Unspoken in Lebanon but obviously on the agenda is what can be done to diminish Hezbollah’s ties to Iran and its antagonism towards Israel? With Israel intent on brandishing its “privilege” of US guarantees of military dominance in the region, and its anti-Iran campaign in sync with many US political leaders, its power cannot be overlooked in formulating scenarios and discussing policy options. Similarly, Iraq, still facing ISIS and the remnants of the ISIS caliphate, wants to be able to manage its own affairs, a goal that may not be possible without alienating some military, political, and religious factions in Iran. It will be a long, hot summer. With the election process almost completed, awaiting several challenges lodged with the Electoral Commission, Lebanon’s power brokers are moving ahead with crafting a new government within the framework of the power-sharing agreement. Since the total number of members allocated by sect is already set, the negotiations focus on three primary concerns: balancing the election results within alliances that represent the dominant parties, allocating ministerial portfolios along sectarian lines, and ensuring that the members support a ministerial statement outlining government priorities and policies. From outside Lebanon, the view is that there are three overarching issues to be addressed: corruption, Hezbollah’s military role, and the future of the Syrian refugees. While this does not ignore the close to a half-million Palestinian refugees, border demarcation with Israel, or dissociation, meaning staying out of regional frays, it highlights the reality that international donors are insisting on a link between further funding and accountability, and that regional stability depends on Hezbollah acting less as a proxy for Iran and more as a key Lebanese political force. In his statements, President Aoun as recently as this week, made it clear that he is not prepared to wait for a political settlement. “We are surprised by the position of some parties which obstruct this return or do not encourage it. Lebanon faces many challenges with 1.8 million displaced people on its territory since 2015,” he said. He believes that nearly 50 per cent of Lebanon’s population is made up of refugees if you count Syrians, Palestinians, Iraqis, and others. He made some of his strongest rebuttals in response to the position taken by the EU and UN at the Brussels donors conference to gather for the refugees. He rejected their position that the host countries must do more to assist in providing jobs, services, and future opportunities for the Syrians. Aoun pointed out that there are safe areas inside Syria where refugees can return safely, noting that Lebanon is doing as much as it can and should not be asked to do more. Even the UN Resident Coordinator and Humanitarian Coordinator for Lebanon, Philippe Lazarini, warned that Lebanese society is witnessing “increasing fatigue” as a result of the refugee crisis. He highlighted that such concern may turn into anger and tension between different segments of society, amid great pressures on employment opportunities, if not addressed by the government. Aoun clarified his earlier comments, noting that he was not including people who faced political problems with the Assad regime. Two recent studies help frame the challenges in devising “return with dignity” scenarios. There is a 2017 UN data report indicating that more than 75% of Syrian refugees live below the poverty line and are unregistered so that they are unable to legally access the labor market and are often exploited in the informal economy, living on humanitarian aid, under the threat of arrest and hostility from host communities. Refugees have also had a disproportionate negative impact on the host communities. The same study pointed out that most Syrian refugees have settled in Lebanon’s most marginalized regions, placing them in direct competition for access to work, public services, and resources with vulnerable Lebanese communities. There have even been claims that the influx of refugees is often cited as a reason for Lebanon’s stagnating economy. This same survey showed that 70% of Syrian refugees would go home if they felt there was somewhere safe for them to return to. This sentiment was echoed in a more recent study, found here, by the Carnegie Middle East Center that outlined four conditions that refugees surveyed indicated were essential to return. They are safety for their children, an end to conscription, physical homes to return to, and a safe and secure environment. The study noted World Bank estimates that 30% of Syrian homes have been completely destroyed or damaged. Many undamaged properties are occupied by regime-affiliated forces, pro-Iran militias, or other Syrians displaced within the country. Of the refugees interviewed, 80% had fled Syria due to incidents that stoked fear for their safety including arbitrary arrests by Syrian forces, the death of family or friends, and the deterioration in security conditions in their neighborhoods. A great majority could not see Syria stabilizing under the Assad regime. “Even if jobs and services were available, few believed the security and stability they want would exist if he remained in power.” Additional concerns were raised about the foreign forces in the country and the interference of outside powers determining Syria’s future. For generations, Lebanon has been a safe haven for dispossessed people of the region despite its limited resources and governmental infrastructure. What the new government will say about its Syrian refugee policy will indicate how much further Lebanon is willing to go to support its good neighbor policy. Lebanon Moves On after Parliamentary Election – But In What Direction? A number of sources have compiled lists of Sunday’s winners, and Annahar grouped them by likely alliances so it is quite helpful to see districts by winner and affiliations. What the results actually mean, going forward, is the subject of a great deal of discussion and speculation. Those who have the most experience in the region are loath to predict how the new government will reflect the election outcomes since the number of members does not necessarily translate into ministerial posts. Even the Jerusalem Post opined that early assessments that painted the results as a black and white victory for Hezbollah may be quite off-track. “It is a victory for Hezbollah but it is far from the ‘Hezbollah swept the election’ story that some are putting forward. Hezbollah is only stronger after the election because its allies are stronger.” The question is whether the allies will remain in lock step with each other. What we do know is that the election took place under a new law and with a relatively low turnout – some under 50% of qualified voters, that both Hezbollah and its allies and Christians opposed to Hezbollah strengthened their core support, and that it was relatively free of violence although a number of complaints have been filed contesting outcomes in Beirut and elsewhere. According to Washington Post reporting, PM Hariri’s Future Party lost some 11 seats but at 21 is still the largest Muslim party in Parliament, which bodes well for his return as prime minister in a new government. Hezbollah and its various allies stand at some 67 seats if one includes Sunnis who support the Assad regime in Syria, and Amal, the oldest Shia party. This alliance now has a blocking minority that can prevent passage of any significant legislation, if it holds together. Interestingly, the right-wing Christian Lebanese Forces, which almost doubled its number of seats to 15, and Hezbollah, have called for combating corruption a priority for the new government. http://www.abinaderadvisoryservices.com/blog/wp-content/uploads/2018/05/lebanon-flag-for-blogs-01.jpg 552 1773 Jean AbiNader http://www.abinaderadvisoryservices.com/blog/wp-content/uploads/2018/05/AbiNaderLogo1-300x103.png Jean AbiNader2018-05-11 13:46:122018-05-26 16:37:07Lebanon Moves On after Parliamentary Election – But In What Direction? Is There Any News about Lebanon Besides the Elections? Depending on the source, and the time of day, prognostications about Lebanon’s parliamentary elections provide even more confirmation that the results will either be a landslide for good or for evil or somewhere in between. We are assured, simultaneously, that the new electoral law eases the way for new entrants into the system and that there is little chance for unaligned candidates to break into the closed loop of Parliamentary districts. Well one area in which there is a bit of sunshine is the number of women who have entered the contests. Although the number of female candidates from the original list has declined by some 22%, there are still a record number of 86 female candidates competing for Lebanon’s 128 legislative seats in a country where women make up only three percent of the current parliament. Lebanon ranked 137 out of 144 countries on the Global Gender Gap Report 2017, published by the World Economic Forum (WEF), and 142 when it comes to political empowerment, as reported in an article in Al-Jazeera. A long way to go for sure and it is hoped that more women in parliament will lead to ground-breaking legislation and role models that start to improve Lebanon’s ranking through empowering more women and girls to enter the public political space. But the old guard is not going softly to their cabanas on Zaitunya Bay. More than a dozen candidates are directly related to current power brokers and are heavily favored in their districts. 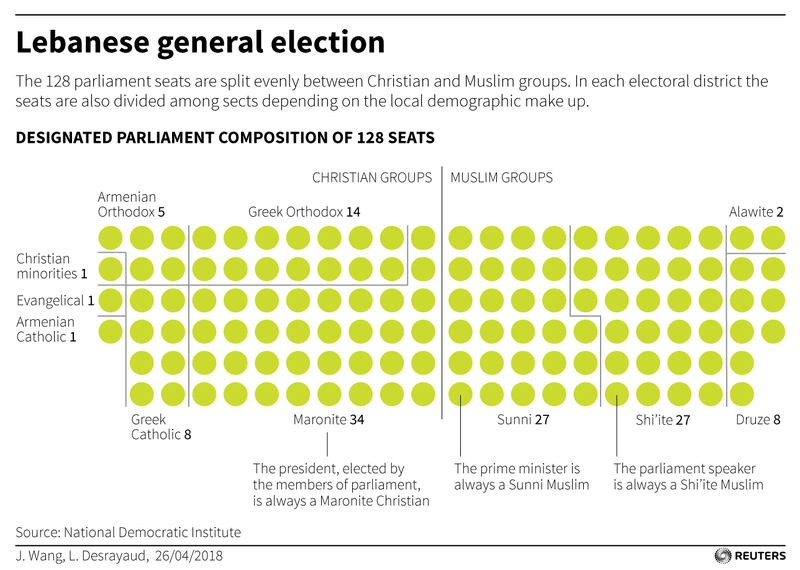 In addition, the existing distribution of seats divided equally between Christians and Muslims further excludes new entrants (National Democratic Institute graph http://fingfx.thomsonreuters.com/gfx/rngs/LEBANON-ELECTION/010062EN4C9/LEBANON-PARLIAMENT.jpg) demonstrates the overall distribution). As in other countries, access to media is important and is priced out of the range of smaller parties, independents, and those who don’t own or have major influence with existing outlets; so social media is important in reaching out to voters. The Lebanese Center for Political Studies (LCPS) published a very useful article describing how power brokers and parties work to influence voters and make sure they participate correctly in the election. The system relies of building strong ties with influencers in local communities and ensuring that services target those who can best mobilize votes for particular candidates. Given that there are a number of competitive races and the heightened interest in the positions of the candidates on domestic issues, party platforms have appeared addressing local concerns. Among those mentioned most often are quality health care, access to a functioning power system, educational reform, waste management, the environment, infrastructure improvements, transparency in government contracting, reducing corruption, and enhanced human rights protections. Clearly on the table but largely unspoken are how to deal with the Syrian refugees, assistance to host communities, eliminating bias in government programs and the army and security services, and internal power balances among Sunnis and Christians. The most critical issue, if and when Hezbollah will draw Lebanon into a war with Israel, is only mentioned loudly by Hezbollah and its allies, continuing to claim that they represent Lebanon’s best security guarantee. While some have mentioned that Hezbollah will increase its seats in parliament at the expense of Sunni representation, there is a bit of hopefulness that their bloc will not attain the two-thirds needed to have a veto-proof majority in parliament, despite the reality that it only takes one-third plus one to ensure gridlock, as Hezbollah has demonstrated skillfully in the past. So while Lebanon is on the edge of a ground-breaking election, it continues to teeter on the brink of an unwanted war that the great majority Lebanese wants to avoid. The policy of dissociation, staying out of the affairs of others in the region, will be the first item on the table for the new parliament given the rapid consolidation of Assad’s power in Syria, bringing even more pressure on Lebanon on multiple fronts. Managing this complex agenda will take all of the skills of the executive and legislative leadership in the country. Jean AbiNader http://www.abinaderadvisoryservices.com/blog/wp-content/uploads/2018/05/AbiNaderLogo1-300x103.png Jean AbiNader2018-05-05 20:59:052018-05-05 20:59:05Is There Any News about Lebanon Besides the Elections? By many accounts, Tripoli was once on par with Beirut as a leader in commercial and economic activities. Dating back at least to the 14th century BCE, it has many historical and cultural sites, including the Citadel of Raymond de Saint-Gilles, the largest Crusader fortress in Lebanon and the second largest amount of Mamluk architectural heritage on earth (behind Cairo). It is now seeking to recapture its economic prominence. Several sources make note that “A Tripoli development plan called ‘Tripoli Vision 2020’ has been formulated and supported by a number of advisory councils including influential key government officials and prominent businessmen in the city. The goal of the project is to provide a comprehensive framework consisting of promoting investment, training, re-skilling, talent placement, and output promotion to reinvigorate the city’s economy.” A number of these projects are included in the Capital Investment Plan that garnered broad international donor support at the recent CEDRE conference in Paris. Financing aside, there are many obstacles to promoting economic growth and delivery of essential services in the north of Lebanon. This blog will focus on two competing visions: that of Salafist militants who are a source of continued instability in the region, contrasted to the work of the NGO Levant Local www.levantlocal.com, which is pioneering work among youth to deliver social services to underserved and marginalized communities. In fact, individuals and groups studied appear to adopt Salafism to receive subsidies from outside funders, and use religious rhetoric to justify “Acts of violence that seem like Salafi militancy but rather align more with long-standing local traditions of social unrest; or providing a vocabulary and platform to contest local sociopolitical marginalization.” If that is accurate, then the recent rise in Salafi militancy reflects local grievances, identity conflicts, and competing power networks. As with militants from Morocco to Iraq, seeing them only through a security perspective obscures options that may be effective in defusing tensions, reducing instability, and rebuilding communities. It is in communities that feel marginalized, deprived, and decoupled from the country’s power structure that the Salafists are making inroads, using Gulf money to open schools, run charities, fund orphanages, and help refugees in the absence of the state. And it is in this contested space that Levant Local is taking a stand, investing its resources, and working to make a difference. While the national Capital Investment Program and Vision 2020 move through the system, Levant Local is leveraging local resources and ambitions to promote safe spaces for young people by equipping them with knowledge and skills to combat extremism; and they are helping Syrian refugees acquire the tools to build the future Syria. What makes their approach vital? Think of the government as a top-down approach that has to move through the vagaries of the Lebanese political system, and Levant Local as a grassroots strategy. It is empowering young people, women, and local and community groups to develop solutions with limited resources without the numbing bureaucracy that constrains the operations of international NGOs and government agencies. A few statistics comparing Northern Lebanon (NL) to the Bekaa Valley (BV) area highlight the scope of the challenge. There is 3 times the number of Lebanese in NL (791K to 275k), and it has 9 times the number of people living below the poverty line (608k vs 66k). Although both have a similar number of Syrian refugees (350k), many more Palestinian refugees live in NL (87k vs 6k). So how does NL deal with more than a million poor Lebanese and refugees when it has less political clout and access than other regions? It relies on the resilience of its people, the energy of its youth, and hopefully the wisdom of local leaders who understand that the future of Northern Lebanon rest on an inclusive, dynamic, and power-sharing formula that gives all Lebanese a chance to achieve their dreams. The Paris IV conference brought together more than 40 countries and institutions to address the need for funding infrastructure projects in Lebanon. The result, as reported in numerous media accounts, is a commitment to some $11 billion in support, mainly in the form of soft loans and concessionary financing for more than 250 projects presented by the government of Lebanon. While some may see this as a ringing endorsement of Prime Minister Saad Hariri’s efforts to draw attention to the needs to stabilize Lebanon’s economy, whether or not Lebanon is up to the task of managing the commitments has yet to be determined. However, the financing will not come about without hard lessons ahead for Lebanon’s patronage and political wasta system. Hariri’s game plan has a number of triggers to attract international investors, particularly the use of Public-Private Partnerships (PPPs) that wed government planning and seed funds with investor expertise and control. The danger is in the low level of expertise in the public sector in negotiating PPPs, which can lead to unjustified risk-taking and risk-allocation by government agencies. Reuters reported that “Jarvis also pointed out that following the IMF’s proposed measures are fundamental to reduce the government’s budget deficit, which includes raising the VAT rate, reintroducing taxes on petroleum products, and raising electricity tariffs to cut down on the subsidy bill. The donors are well aware of the challenges to Lebanon due to many political shocks of the past decade, the continued security challenges, and the burden of support more than 1.5 million Syrian refugees. “The small Mediterranean country’s debt-to-GDP ratio is the third-highest in the world at 148%, and annual growth is projected at around 2% for 2018. Among the major donors was the World Bank, which pledged $4 billion in low-interest-rate loans. Saudi Arabia reactivated a $1 billion line of credit and France pledged $492 million in low-interest-rate loans and $183 million in grants.” The United States committed some $110 million as a grant. The hard road ahead will only prove more difficult if Lebanon does not adopt needed reforms to make its economy and government more efficient. With a mix of grants, concessionary loans, market loans, and guarantees, having a robust and transparent management system is paramount if Lebanon is to achieve its badly needed economic targets. Estimates are that the first phase of study and initial projects will take four plus years and cost $10 billion, with a total of $17 billion needed over the following seven years. Lebanese officials maintain that the private sector would finance around 40 percent of the program, while any grants and loans received would be used for the remaining 60 percent. Yet some view these soft loans – with an interest rate of around 1.5 percent over a period of 20 to 30 years – as an extra layer of debt. Not great news if not properly managed. Up next is the Brussels conference scheduled later this spring, which will focus on the Syrian refugee crisis.